GER3 is now responding to Hurricane Michael which caused devastation and a need for significant debris management operations in the Florida panhandle and many other areas. The GER3 team has arrived in the affected area with equipment (including clean up kits, generators, telecommunications equipment, personal protective equipment, and more) and is now operational. GER3 is targeting support to especially vulnerable families and providing the appropriate support to get them back into their homes as quickly as possible. As with all GER3 operations, we seek to use sustainable supplies, recycle available materials and respond based on the needs specified by the communities and households themselves. We plan to match the GER3 'build back better' approach to meet those needs as best as possible. GER3 believes response is strengthened through partnerships, and is looking forward to working with other great organizations already in the area to have a deep impact on targeted families. 100% of any donations go directly to the GER3 Michael operation and will help people recover as quickly as possible. Additionally, GER3 is now on Amazon Smile! Click here (https://smile.amazon.com/ch/81-0690876) when you do your Amazon shopping as a portion of the amount you pay will come to GER3 at no extra cost - thank you for your support! GER3 has conducted initial needs assessments with a particular focus on debris management and has initiated response programs to address needs of the most vulnerable. A small GER3 team has developed on site, including several local Indonesian team members. Equipment (generators, excavators, bulldozers, etc) have been procured and debris management operations have begun. New debris estimates from Urban Resilience Platform (urplatform.eu) emphasize the significant debris management work ahead in Indonesia. Estimates suggest over 6.6 million tonnes of debris. GER3 will continue to assess options for debris removal and reuse in various communities, particularly in schools. GER3 is now working with the government of Indonesia to help clear a school in Palu that was hit by the tsunami. The GER3 excavator has already helped to clear over half of the site. The team is considering demolition activities, assessing which materials can be salvaged and reused, and developing plans for redevelopment. 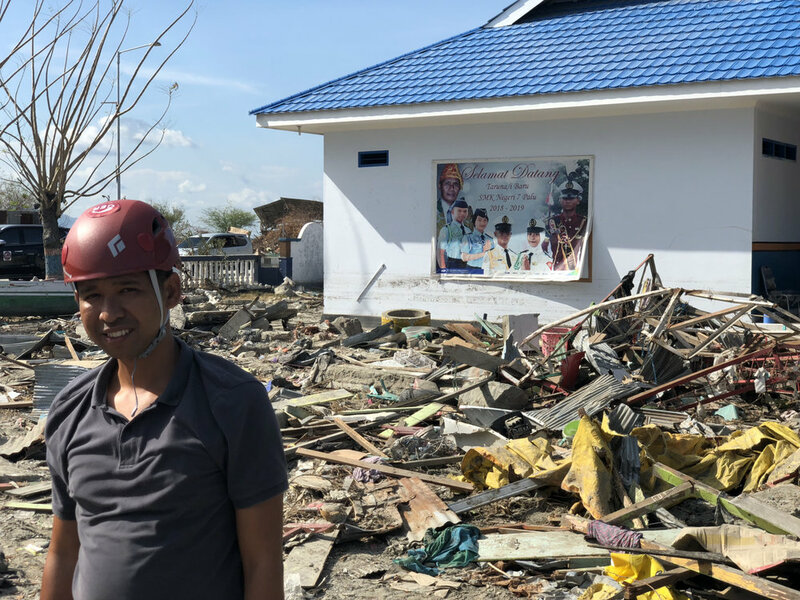 In response to the recent earthquake and tsunami in Sulawesi, Indonesia, GER3 is deploying a disaster response and recovery team to conduct initial assessments, deliver assistance and design programming focused on debris management and building back better. GER3 will be targeting support to local communities (households, schools and health facilities) supporting them to manage all of the debris and shelter challenges they currently face. Our team will work with community members to identify the most vulnerable areas, understand what the community needs are and provide support to help targeted communities recover as quickly as possible. GER3 will seek to develop programming with partners (Indonesian and international) that meets immediate and longer-term needs in a manner that respects local practices, is sustainable (usually involving the recycling of materials) and high impact. Additional updates will be coming, but also be sure to follow our work on Instagram, Facebook and Twitter! GER3 staff have officially returned home after providing over four months of support to the Waitt Foundation in Antigua and Barbuda. The Waitt Foundation has been operating in Antigua and Barbuda since 2014, providing resources and expertise to help conserve the islands' ocean resources. After Hurricane Irma struck Barbuda on September 6th 2017, Waitt converted its resources to provide recovery services for the affected population through the Barbuda Recovery and Conservation Trust (BRC Trust). With support from GER3 day-to-day operational leadership, the BRC Trust operation has employed over 30 Barbudan workers, transported 828 people back to Barbuda and provided over 300 people with social services. BRC Trust programs also helped to support two Barbudan restaraunts, sponsored over 80 Barbudan children living in Antigua to attend a swimming and football camp, and helped to feed and shelter over 130 dogs abandoned on the island after the storm. For more information, please visit the GER Projects Page. GER3 reinitiated its Hurricane Matthew Sustainable Tree Recovery program in select communities of Dame Marie, Haiti in early 2018, thanks to a generous contribution from the MacFarlane Foundation. In just under two months the team has successfully cleared over 450 square meters of fallen trees and created 300 wooden planks from recovered wood. Eighty percent of these planks are given to the landowner to rebuild structures and livelihoods, while the remaining planks are given to local municipalities to fashion into structures for schools, health centres and communities. The program is estimated to have over 1,000 beneficiaries, including paid workers, landowners, staff and community members affected by the storm. See pictures from the operation at the GER3 Projects Page. GER3 will be sending an assessment team to the US Virgin Island on Wednesday, October 11th in partnership with J/P Haitian Relief Organization. Tim Williams (tim.williams@ger3.org) and Jason Riffe (jason@jphro.org) will arrive at Henry E. Rohlsen Airport in Saint Croix with the equipment required to immediately begin evaluating the needs of affected communities, and how GER3 may be able to support recovery efforts.